Inspired by a friend, I dug out my unfinished One Block Wonder to see if it was something I could easily finish. Imagine my excitement when I discovered that all the hexagon halves were made along with a couple of practice cubes from One-Block Wonders Encore!" by Maxine Rosenthal and Joy Pelzmann. All that remained was to come up with a pleasing layout. This is the fabric I started with, Jack in the Pulpit from Jane Sassaman's "Sunshine and Shadow" line by Free Spirit/Westminster fabrics. It's been a while since I began this project so I don't remember how much fabric I purchased. Six pattern repeats are required and judging from the estimated size of the finished object, it was likely a short repeat (about 12") so I probably started with 2 yards. The straight lines in the pulpit flowers and stems led to some less-than-interesting blocks but I needed to use them all. The colors of the kaleidoscope blocks broke down into a few mostly black, a few more mostly blue/purple, and a lot mostly green. I decided to use the blacks in a diagonal pattern to separate the blues on top and the greens on the bottom. You can see in the photo where I added in the cubes. I have also made some half cubes to fill out spaces in the sides. It has green, the RSC color of the month (and purple, the color for March)! This is the last Sunday in the month of May, the last opportunity to report on my Rainbow Scrap Challenge progress for the month. It really wasn't until recent days that I was able to seriously think about my green scraps. I haven't even opened the green scrap box, but I did manage to make ten 6-1/2" string blocks from the string bucket. I usually try to find a UFO that includes the color of the month, but I couldn't find one this month, until .... my friend Diana mentioned that she had dug out her unfinished One Block Wonder to work on. Thus inspired, I dug mine out only to discover that there's a lot of green in it! OBW from Jane Sassaman "Sunshine and Shadows"
It's more of an olive green than a forest or evergreen, but I'm counting it. If I can come up with a pleasing layout in the next few days I might even have a finished top for the month. Linking up with Angela at Scrap Happy Saturday and Cynthia at Quilting is More Fun Than Housework. Being a relative newcomer to modern quilting, I thought that joining in on the "Thoroughly Modern Mini" swap among the four Tennessee guilds would be a worthwhile challenge, a chance to try new things on a small scale. My swap partner didn't provide a lot of guidance -- just four of her favorite colors: eggplant, orange, lime, and aqua. I was never happy with the lack of contrast in my first attempt, a double star. Plus the gray I had selected for the background was DEAD. Plus, I had no clue how I would quilt it! My second attempt at the double star was way too dark and dreary to even warrant a photo. Time to take a whole new direction. I dug out piles of books for inspiration and decided to do a fan blade kinda thing. I tried 10-degree, 18-degree, and 30-degree wedges. I tried background on both ends. I tried this and that ... The size was getting out of hand (could be no bigger that 24" square). I was running out of the selected fabrics and wasting the precious background fabric. I had to do SOMETHING and didn't want to waste more time trying out options. Could I do something creative with the parts I had already constructed? 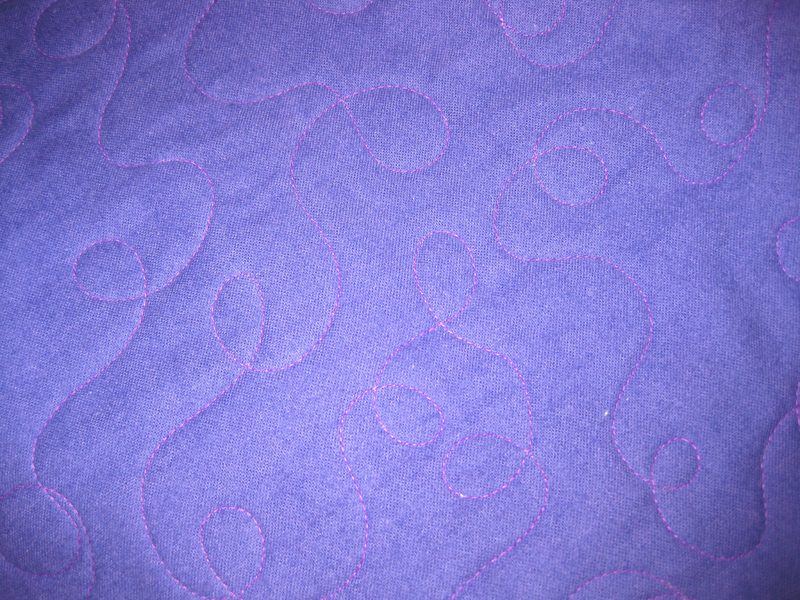 Then I took a big gulp of air (and a little gulp of wine -- OK, maybe a big gulp of wine) and started quilting. I decided to use my Pfaff with dual feed and that turned out to be a good decision because of the variety of attachments at my disposal. First I top-stitched the serpentine piece about 1/8" from the edge using an open-toe foot guided along the edge of the curve. Next, I broke out the stitch-in-the-ditch foot to extend the wedges in matching threads out to the edges. I used my Clover Ball Point stiletto like a hera marker to mark my straight lines. I bound the edges with the same fabric used on the back -- two of her favorite colors. This will be going in the mail this week. I sure hope she likes it! Linking up with Connie at Free Motion by the River. And with Kaja at sew slowly for Ad Hoc Improv Quilting. Like Cynthia at Quilting is More Fun Than Housework, I sometimes find working with leftovers more interesting -- certainly more challenging -- than working with the pattern the leftovers came from. Last week at retreat I finished this top which started with the leftover 9-patches from Wink & a Smile. The block is a variation of Sister's Choice except the outside round is 1/2" bigger than the squares in the 9-patch. This allows the star points to float and there is no matching of the points where the blocks come together. So no sashing is required, either. The deets, as they say: Variation of pattern from 9-Patch Reunion. 9-patch made from 2-1/2" squares, outside background cut at 3", sew-n-flip corners are 2-1/2" squares. Block finishes at 11". I made my quilt 5 x 7 or 55" x 77". Linking up with Oh, Scrap! Nancy's Japanese Magic - gorgeous! There was a lot more going on that I failed to get pictures of. And a good time was had by all. Several years ago I took a class for a QAYG "braid" table runner. Soon after that I taught my fellow guild members how to make one. Then I made a few as Christmas gifts. But one could not be finished because I somehow ran short of the border fabric with three short lengths left to add. That runner remained folded in a pile on my work table (along with a number of other abandoned projects) in the intervening years. Fast forward to the recent BRP (Big Reorganization Project). And what should appear out of my heaps of scraps but a small chunk of the long sought-after red fabric with a couple of border strips folded up inside it! Unfortunately, there was not enough of the red fabric to do the binding. If I can't find a similar shade of red in my stash I will probably go with one of the blues. It is such a relief to have another UFO, however small, nearing completion! OK, I can scratch #1 (Borders on Smith Mountain Morning) off my list -- not because I finished, but because I screwed up! When I was packing the project I grabbed the largest chunk of muslin that I figured I could cut the inner border from. Well, it turned out to be crappy fabric -- very thin, stretchy, and ravelly. I tried to convince myself that everything would be OK once I got the outer border on. NOT! If I tried to square up this corner I'd lose most of the inner border; if I just went ahead and added the last border, the whole dang quilt would be cattywompus. So after five hours of effort I put it all away figuring I needed to be in a better frame of mind before I decide if I wanted to tear the whole mess off and start over or just do some surgery on this, the worst of the four corners. BUT I DID finish #2 - Last border on Summer Heat!!!! I especially love the border fabric which is also in the corners of the blocks. It reminds me of spinning fireworks. That was the first afternoon and evening. On Tuesday I set to working on Chex Mix. I had stitched all the sew-n-flip corners at home with the intention of doing a second row of stitching to make bonus triangles once I got to retreat. After doing only one of the 35 blocks, I decided it would be faster to just trim carefully and use them as leaders/enders. What I thought would be a one-day project -- considering the 9-patches were made, the sew-n-flip corners were stitched, and the blocks all kitted up -- has taken two days. Couldn't have anything to do with all the shenanigans and frivolity by any chance, would it? With the remaining hours of today I'll have this together. We've had a great time. Tomorrow when I get home I'll give you a look at what everyone accomplished. Apologies to those who have commented on recent posts; I'm waiting till I get home to give them their proper due. My old guild has been kind enough to include me whenever they have an open space at retreat so I'm off to camp this afternoon. Too ambitious for 2.5 days of sewing? If I can mark at least 3 items off the list, I'll be a happy camper. I have a dining table! During my Big Reorganization Project (BRP) I've had a secondary machine set up on the dining room table so that I could get some essential sewing done. I was also using the dining room table as a sorting/organizing space because I lacked any large surface in the sewing room to accomplish these tasks. I'll be the first to admit that my dining room, which is rarely used for dining, frequently becomes a dumping ground for incoming mail, laundry that needs to go upstairs, items to go to Goodwill -- well, you get my drift .... basically, anything that I don't want to despoil the rest of the main living area gets stuffed in there. And with the lights off, the mess is like mushrooms that multiply in the dark. ... and wanted to make a test block before doing a lot of unnecessary stitching. Once again the table was buried. ... but needing to get back to the matter(s) at hand, mainly the BRP, I have packed up the strips and all the pieces-parts to use as leaders/enders at retreat next week. I got my table back (and I didn't even have to use TitleMax to get it back -- sorry, I digress). The machine will remain through the weekend since I plan to work a bit on the swap mini. It will be packed up for retreat and then hopefully I'll find a spot for it on the main floor as I find it's been quite convenient to pop in and do a bit of stitching while dinner is cooking. A clean table is definitely a whoop-worthy accomplishment in my world so I'm linking up with Sarah at Confessions of a Fabric Addict. Also linking with soscrappy for Scrap Happy Saturday. A couple days ago I was dithering over what to do with the pile of 1-1/2" strips -- mostly yellow and green with a little purple thrown in -- that I had uncovered in the Big Reorganization Project (BRP). They're not taupe, not even close, but when I saw this quilt in A Basketful of Taupe by Kylie Irvine, I could see the possibilities. OK, so I might want to make some basket blocks .... but all those alternate blocks are various combinations of mostly 1-1/2" strips and an occasional 2-1/2" piece. I think I can piece stripsets of 4 to make most of the blocks. The baskets? I'll break out the fusible and have some fun. I think I can even find an appropriate frame fabric in my stash. Time to hit the machine! Just what I need -- another new project. Good thing there's a retreat next week. It has occurred to me that since some of the strips are green, it will qualify for RSC16!! It pleases me to show that one of my adopted orphans has neared completion. 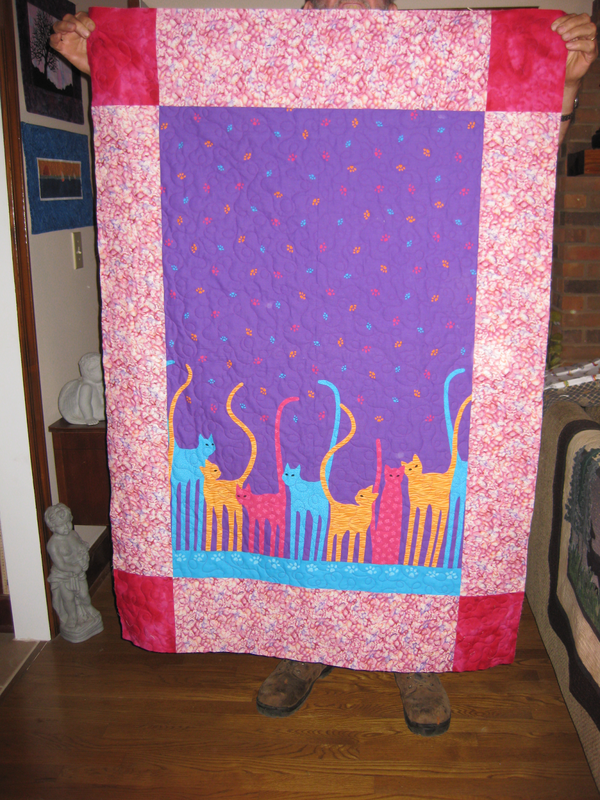 Doris M in Alabama adopted two of my kid quilt tops I called Cool Cats. She has quilted the first one and was anxious for me to see it. 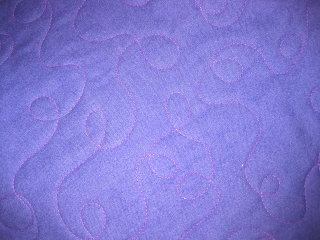 She did a beautiful loopy meander in pale lavender thread. Doris and a friend have a quilt ministry at their church and regularly give quilts to Quilts4Kids. I am so glad that these tops went to competent hands to see them to a finish. Thanks to Cynthia at Quilting is More Fun Than Housework for hosting the semi-annual orphan adoption event. The next one will be in September so be sure to check back then for many exciting items going on the adoption block.